With so many one-dimensional speed horses this year, many of whom were in the Top 12, I’m making a major overhaul this week, dropping several of those types who look like they will be at a major disadvantage going 1 1/4 miles with a contentious pace. Horses like Conveyance and Sidney’s Candy can get back on if they show enough in their next start to indicate the Derby might be within their reach. We’re concentrating more now on horses who have shown they have the running style, pedigree, fitness, class, and toughness to handle a race like the Kentucky Derby Presented by Yum! Brands (gr. I). I’ve been unable to sort out the California horses, so I’ve decided to let them sort themselves out April 3 in the Santa Anita Derby (gr. I), and watch for Dave in Dixie and possibly American Lion on the dirt somewhere. And I’m keeping a close eye on Drosselmeyer, Stay Put, and Mission Impazible in the March 27 Louisiana Derby (gr. II). Even a come-from-the-clouds closer like Ron the Greek bears watching if he can get a fast pace. Drosselmeyer, especially, has a lot of room for improvement. 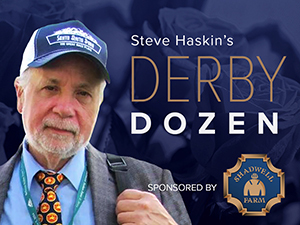 In a bit of irony, three of Nick Zito’s best 3-year-olds—Ice Box, Jackson Bend, and Our Dark Knight, an impressive maiden winner March 20—are all out of Tabasco Cat mares. It was Tabasco Cat who defeated Zito’s Kentucky Derby winner Go For Gin in the 1994 Preakness and Belmont (both gr. I; Go For Gin was second in both races), costing him the Triple Crown. The other irony is that this is the 25th anniversary of Spend a Buck’s Derby, and Ice Box’s second dam is a half-sister to Spend a Buck. Normally don’t like horses having their schedule changed at the last minute, but the Wood (gr. I) looks to be a much better spot for him. He’ll get tested and will be tighter and tougher coming back in four weeks instead of six. Extremely flattered by Fla. Derby 1-2 finishers, whom he demolished in the Fasig-Tipton Fountain of Youth (gr. II), but the pace that day was much slower. Baffert said he’s now considering staying home for the Santa Anita Derby. He’s had his tough race in the Rebel (gr. III), and a great learning experience as well, and now just needs to get a good conditioning race to set him up for the Derby. He can adapt to any kind of pace and can handle any kind of surface. He’s found a way to get beat when pressing the pace, but can come home when taken back. If he can sit back and time his closing kick, he’s going to be dangerous. He’ll get his class test against Eskendereya and several others in the Wood, and he only needs to duplicate the high cruising speed and turn of foot he displayed in the Gotham (gr. III); he doesn’t have to win to be ready to peak on Derby Day. Gave warning of what was to come with big move on the turn in Fountain of Youth. Took advantage of fast pace in Florida Derby and came home in :36 2/5, despite not changing leads—looked as if he was running too fast to change leads. Appeared beaten, but won with final late burst. He’s coming around in much the same manner as Strike the Gold. I’m not quite seeing a horse yet who I think can win the Kentucky Derby in his third start of the year. He will need a strong finish in the Arkansas Derby and for that stamina-laden tail-female family to come out and neutralize all that speed in the rest of his pedigree. But the talent, consistency, and determination are there. He’s had his chances and his excuses; now it’s time to deliver. If he is going to prove himself to be a legitimate Derby horse, he has to step it up a notch. He needs a good ride and a good trip. He hasn’t shown the quickness you like to see, and maybe 10 furlongs isn’t his game. But he has one more race to show that he’s a legitimate contender. The main concern with him at this point is the indecision whether to run him again or train up to the Derby. No time for indecision at this late date. Going into the Derby off a 7-week layoff and no 1 1/8-mile races is asking a lot. If he’s not physically up to another race, how can he handle the Derby with so little foundation? His placing on here will depend on their decision. Hesitated at first to put him on because his dam was strictly a 6f speedball and he couldn’t put those horses away in the Tampa Bay Derby (gr. III), but he’s only one of very few who have shown an explosive turn of foot. With three straight bullet works and two big races at Tampa, he should be dead-fit and still has a lot of room for improvement. He’ll get a lot out of the Tampa Bay Derby, but it’s the same old tune: he has to show he can be effective from off the pace. Decided to drop the pure speed horses for now, but keeping him on because I believe he can rate if given the chance. But time is running out. Stablemate Rule had every chance to rate with that fast pace, but wasn’t taken in hand and got cooked battling for the lead. And he’s run out of opportunities. Yet another Pletcher horse who still has to show he’s versatile enough to win from off the pace. He’s far from a speedball and does rate kindly, so, like Super Saver, giving him one last chance in the La. Derby, because he’s already shown he doesn’t need the lead. San Felipe didn’t set up for him at all. Ran a strong race, but couldn’t match strides with Interactif in the final furlong. Did lose more ground on the turn, so all in all it was a good enough effort to keep him in Top (Baker's dozen) 12. He’s developing quite a rivalry with Ice Box. Appeared to have him beaten in the shadow of the wire, but let it slip away. Both earned a solid 99 Beyer Speed Figure. It’s hard to know where they fit, because they’re so far behind Eskendereya, with a lot of lengths to make up. The (two-second) faster pace in the Florida Derby helped a great deal.